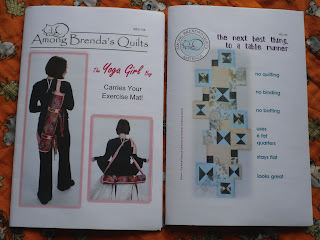 Last night at my local guild meeting, our guest speaker was Brenda Miller from Among Brenda's Quilts. Brenda brought four huge suitcases full of quilts along with a few dozen purses and bags. She entertained us for almost and hour and a half relating to us the story of how she first became a quilter and then a prolific quilt designer. There are over sixty of her patterns on her website. Her work is gorgeous. I love her philosophy on bag design. 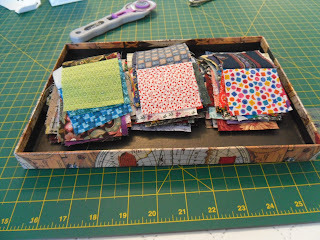 Don't make it complicated, many quilters want to be able to complete the project in one or two days, and eliminate the hand stitching or keep it to a minimum. 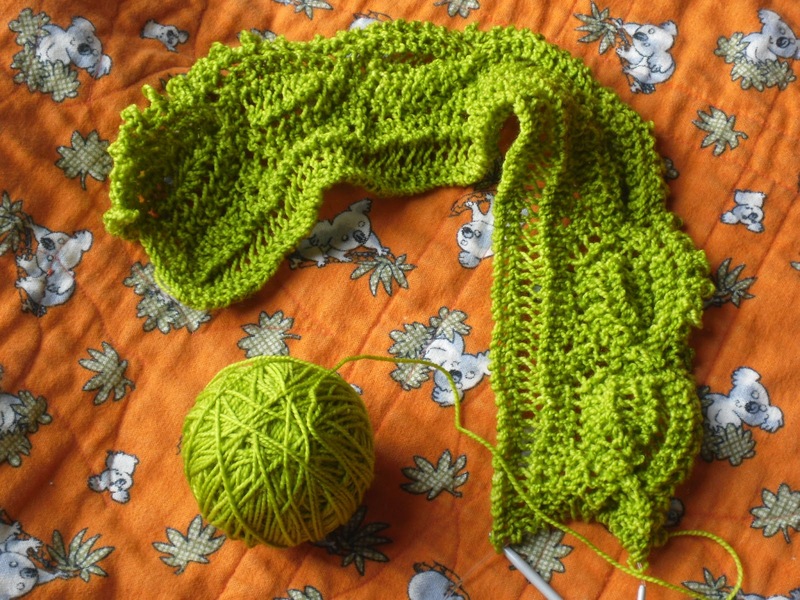 Her patterns are all rated for skill level as she found herself as a beginner attempting a complicated pattern without realizing it. It was hard to do, but I did manage to limit myself to the purchase of two patterns. The first is The Yoga Girl Bag. This is a unique bag that opens along the length such that you can easily put your yoga matt inside instead of the usual draw string tube that you end up having to shake the matt into. Daughter has been taking an introductory yoga class lately. I think it will be fun to make this bag with her. My mother made The Out and About Bag. She said it was fun to sew and even more fun to carry around. You can see a photo of her and her bag at this post. One further thing that Brenda talked about, was setting goals. If she hadn't set herself a goal to design a certain number of patterns by a chosen date, she might not have launched this career. She challenged each of us to select two goals to accomplished by the start of the summer and further urged us to share them with others. Once you tell your goal to someone else, it serves to encourage you to achieve it. 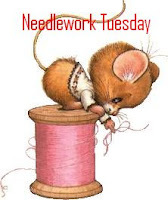 Now is your chance to share a needlework goal with me. Leave me a comment and tell me of a project you want to complete. Then come back each week with an update, or I can visit your blog and encourage you. This is what I do here when I share my projects. You know I am working on them, and if I haven't worked on it during the week, I quickly pull it out on Monday and work on it for a few hours so I will have progress to show you on Tuesday. I find this a very helpful technique. Brenda's patterns are widely available in Canada and the United States, check this page for further details. I managed to find a bit of time to work on my Amalia shawl. I introduced this to you about three weeks ago. Still on the first ball of wool, though I am now on repeat 8 of 27. I am getting more used to the stitch pattern, but I still don't understand the mechanics of it. Concerned that I might have a bit too much free time on my hands, I decided to start a new project. the Fading Charms Quilt is being hosted by Deanna at Wedding Dress Blue. Were you part of the seemingly millions of quilters who traded 2 1/2 inch charms at the turn of the millennium. I was and I still had all those charms sitting here. I never did get to 2000 of them, but I had enough. Deanna's pattern for for a 72 inch square quilt, but I am going to add six rows so mine will be approximately 72 x 84 inches. Her version calls for 846 charms, while my revision calls for 1002. I didn't even have to cut any. I have cut a few since I started sewing, as I found that some were not up to size and others the fabric was just too icky to be included. It's looking like I may have to add some orange charms as they seem to be missing. There sure are a whole bunch of blues and greens. Must be popular quilt fabric colours. For my first step I am chain piecing them in pairs. I did these yesterday. This morning I wanted to finish listening to my audio book, I had about an hour left, so I sat and stitched. After pressing the seams to one side, this is what I have completed. That was about an additional 120 pairs. 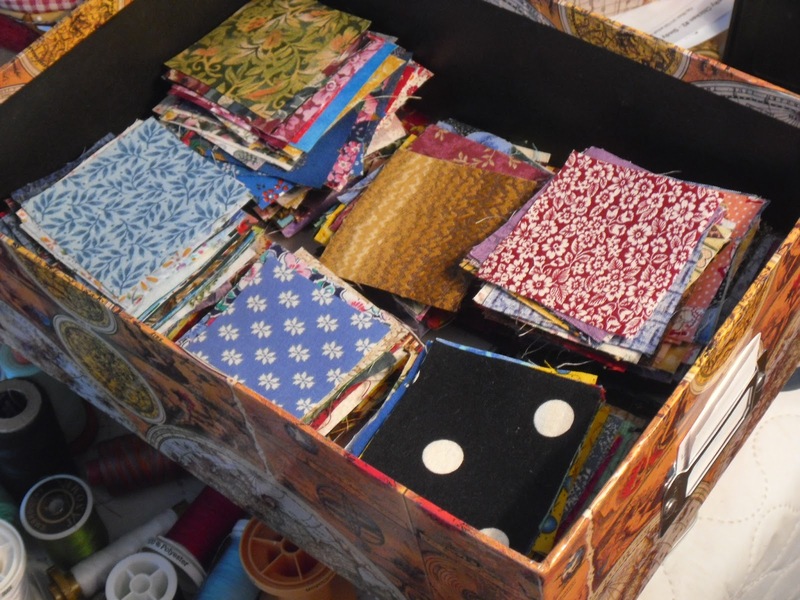 Every now and then I come across and unsuitable piece of fabric and I just toss it over my shoulder to the craft pile (the bits I use to make fabric postcards) and keep a running total of how many I need to replace. I only tossed out four this morning. Deanna suggests that you can also use 2 inch or 1 1/2 inch charms for smaller finished quilts. To get you started on your charm collection, Deanna has a contest to win 100 charms. Visit her blog, Wedding Dress Blue for details. Remember to leave a comment sharing your summer needlework goals. Your charms are, well, charming. It is sure to be a fun quilt. Orange is a good color to add. Also gold and turquoise, if you are short on them. 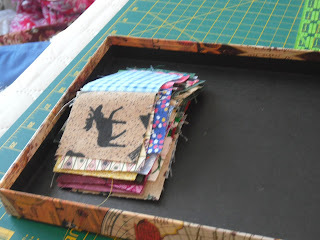 They really seem to make scrap quilts sing. Thank you for sharing the tutorial with your readers. I have no idea what a Fading Charms Quilt is but I can't wait to see it. Lovely to catch up with your projects, as always its been a pleasure to visit.